Are not you tired of mistaking these two? You know they are two different birds and you know each of them symbolizes something. Mentioned in literature and in movies, hawks and eagles hold a different kind of place in the minds and hearts of humans. They are revered, respected, admired. Let see what we can find out to help us better distinguish between these two birds. So what is the difference between a hawk and an eagle? Hey there, This is Bhaskar Banerjee and you are watching YouTube Channel Bhaskban. Both of these birds are birds of prey and they live in areas where their prey is available. There are around 60 species of eagles and more than 250 species of hawks that can be found on all continents except on the Antarctica. The main difference between the two is in size. Despite the fact that there are various species of both hawks and eagles and that they vary in size, it is still obvious that eagles are considerably larger. And since strength comes with size and eagles are bigger, it is easy to conclude that the eagle is stronger than the hawk. Typical eagle weighs 8 Kilograms, while large species of hawks rarely exceed weight of 3 to 4 Kilograms. Otherwise, as far as taxonomy goes, they are both part of the same family, the Accipitridae. They are both really swift fliers and great hunters with strong beaks and talons. Both eagles and hawks have keen eyesight which facilitates detection of food. Eagles fly and hunt their prey in the air and carry it in the claws to the nearest perch where they will tear it apart and eat. Hawks often hide in the trees until potential prey appears. Once the prey is detected, hawks rapidly leave their perches and attack by using the element of surprise. However, hawks go for smaller prey. Hawks hunt and eat rats, mice, gophers, rabbits and large insects. Eagles can hunt and pick up larger animals. such as snakes, medium sized vertebrates and mammals and other birds. Sea eagles hunt fish and marine creatures. Hawks do not consume fish. Hawk have been domesticated and used for hunting, unlike eagles which are more difficult to manage. Both hawks as well as eagles are symbols of greatness, courage, intelligence and achievement. Hawks and eagles appear in the folklore and mythology of various culturs and races. In many mythologies, the hawk is a solar bird, associated with sun gods. Similarly, eagles are associated with sky gods and represent spiritual power, majesty, victory and ascension. In Ancient Egypt, the hawk, was a royal bird. Gods depicted as being hawk headed. The hawk was also associated with the Great Mother Amenti. The eagle was a symbol of the Nile and the royal bird of the Thebans. In Greek myth, the goddess Circe was associated with hawks. A hawk was the messenger of Apollo. In Ancient Rome, the Roman legions marched under a silver eagle, with outstretched wings, clutching a thunderbolt in its talons. Romans believed it lucky to camp near to an eagle's nest and would often bury an eagle's wing near their campsite, as protection against storms. In Polynesian stories, the hawk appears as a prophetic bird, with healing powers. The American Indians consider the eagle as the greatest of birds. It represents, and embodies the power of, Thunder Bird, The Great Spirit. They believe its feathers carry the prayers of people to the father Sun god. In China, eagles are associated with authority and fearlessness. In May of 1782, US Congress was presented with a drawing of the bald eagle as a potential symbol for the country because it represents authority and nationhood. The Javan Hawk is the national bird of Indonesia and is commonly called Garuda, from the bird-like creatures in Hindu myths. Hawk vs Eagle. Facts is that eagles and hawks have keen eyesight which facilitates detection of food. There are around 60 species of eagles and more than 250 species of hawks that can be found on all continents except on the Antarctica. These two tipe of birds can be found in the same area. TEagles fly and hunt their prey in the air and carry it in the claws to the nearest perch where they will tear it apart and eat. Hawks often hide in the trees until potential prey appears. 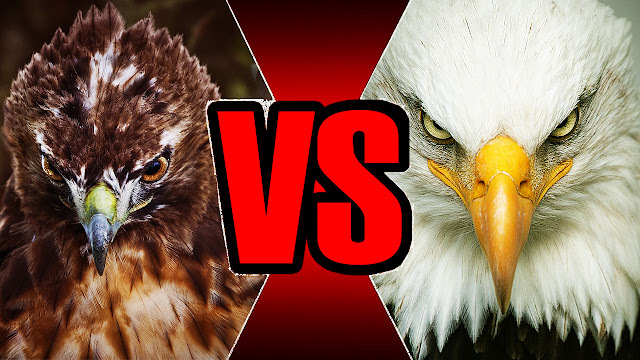 But we found the answer watch Hawk birds vs Eagle video to know more. That is it in this episode, thank you for watching. If you enjoyed it please do not forget to Like, Share, Comment and Subscribe.